Toronto Wolfpack and Toulouse Olympique XIII will kick-off Super League's Magic Weekend in 2018. It is the first time in Magic Weekend history a Championship fixture will open the event, to be held at Newcastle United's St James' Park on 19-20 May. The match, which will kick-off at 12.45 BST, was originally scheduled as a Round 14 home game for the newly-promoted Wolfpack. Toronto won the League One title in 2017, winning 20 of their 22 games. Toulouse, meanwhile, narrowly missed out on the Qualifiers after finishing fifth in the Championship, just one point below Featherstone Rovers. 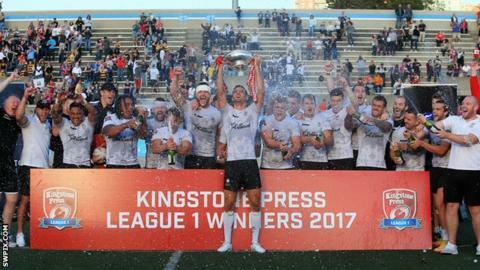 Super League general manager Mark Foster said: "Toronto Wolfpack and Toulouse Olympique are sure to put on a great display and show fans what the Championship has to offer." Saturday's closing fixture will see Castleford Tigers and Leeds Rhinos repeat their 2017 Grand Final meeting. And Hull KR's promotion to Super League sets up the return of the derby with Hull FC, which will complete Sunday's games.